A junior team member ran into this issue so thought it was worth a post. While installing SQL Server 2012 RC0 on a new VM of Windows Server 2008 R2, it complained about installing or enabling .Net Framework 3.5 SP1 which is a pre-requisite for the SQL Server install. Here are the steps to validate whether it is installed and how to enable it and if it is not installed, how to go about installing it. Under Administrative Tools, Select Server Manager and click on Features. All the installed Features are displayed in the right side pane where you can validate if .Net Framework 3.5 SP1 (3.5.1) is installed or not. 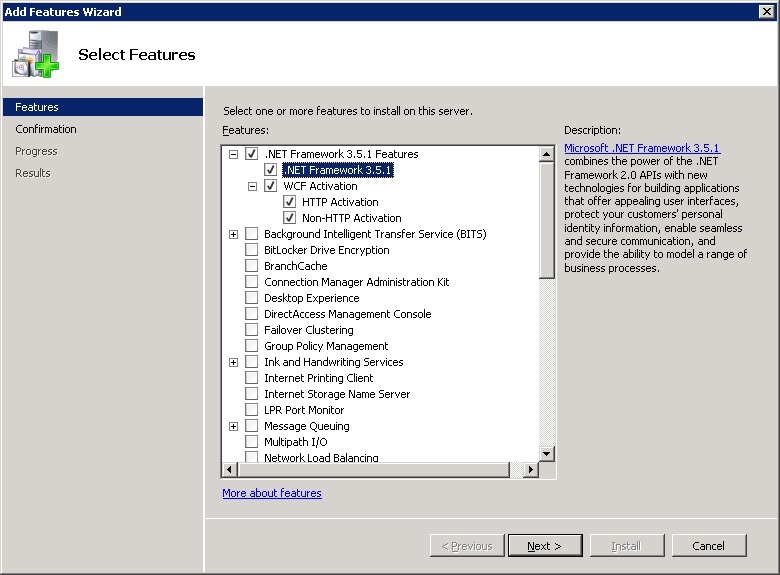 If it is not installed, then click on “Add Features” and expand “.Net Framework 3.5.1 Features”. Check the check box for “.Net Framework 3.5.1 Features” and click on Next and then Install. 5. Once the installation is complete, click on close and you are done. Now, you can move on with your SQL Server 2012 RC0 install on Windows Server 2008 R2. Have fun. What is connection pooling and why is it necessary? A connection resource on the database side is essentially the database server process, the session and the associated memory. In order to utilize the database resources effectively and to provide end user concurrency, applications use various resource pooling solutions. In a typical web based application, connection pooling is typically done by a middle tier like an application server which gets x number of connections to a database and stores them in a pool (like an array). Those are then marked as not being in use. When a request comes in from the end user that goes through the application server, it would get a connection from the pool and use it as well as mark it as “in use”. Once the response is given to the request and the session has been fulfilled, it goes back to the pool so that it can be used by another request. The benefits of connection pooling are obvious – no connect/disconnect of the connections which is an overhead and using pooled connections, one can service the needs to many users. In this post, we will look into pooled connections from a DBA’s perspective i.e. how a DBA can find out whether the connections hitting their instance are pooled or not. So, now we have seen how a DBA can monitor pooled connections from the instance side. And for more understanding of the connection pools, their configuration and controlling connection pool fragmentation, look at the resources section below. We will look into connection pooling in Oracle from a DBA perspective perspective in one of our future posts. Oracle has also introduced DRCP (Database Resident Connection Pooling) in Oracle 11g which is also something we will look into that post. Logon Triggers and EventData() function – here, here and here. MSDN article on connection pooling for the .Net Framework Data Provider for SQL Server – here. Another good article on ADO.Net connection pooling – here. Article at Pythian – excellent article discussing connection pooling – here. MSDN post on SQL Server connection Pooling (ADO.Net) – here. Windows 7 Introduction – here. This is an older one but a very good one for those looking for an introduction to SSIS 2008 – here. Windows 2008 Fundamentals – here. Windows Server 2008 R2, new features – here. SQL Server 2008 Developer’s Training Kit – here. We have covered ODBC tracing before on our blog. While troubleshooting an issue for a client, came across this wonderful MSDN article from MSFT on how to do data access tracing for applications using SQL Server 2008. This came up in a discussion at a client site while working with them on integrating their application with their client’s application. How would you determine what version of the .Net Framework is on your machine or the server? And there you can see the other details like the Install Path and the exact version. a) LINQ to SQL: This is for applications that use objects mapped to the database objects. b) LINQ to Entities: This is for applications that need more flexibility in mapping objects to a RDBMS supported by the ADO.Net data providers. c) LINQ to XML: This provides an in memory XML API. d) LINQ to object: This allows us to do queries against the in memory objects. e) LINQ to Sharepoint: This allows us to query MS Sharepoint lists. f) LINQ to DataSet: This allows us to query DataSets. MSDN Site, LINQ – Basic Introduction, HookedOnLINQ, LINQ to MS Sharepoint, LINQ Books – Pro LINQ, LINQ in Action.